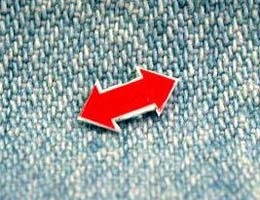 To help cut down on silvering of the decal its always a good idea to put down a gloss coat on the area you plan to put a decal on to. It isn't required, but it helps a great deal. 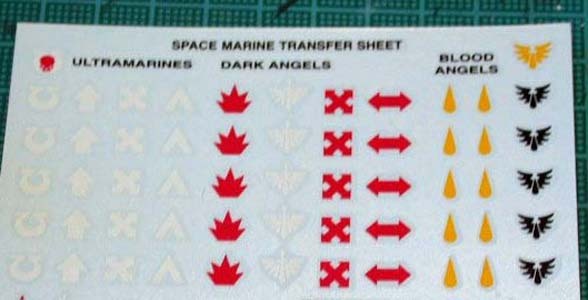 After selecting your decal: [decal1.jpg], you want to cut away as much of the decal paper a possible: [decal2.jpg]. 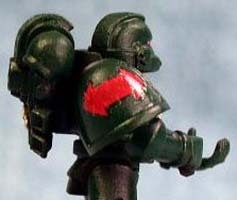 It will make the decal more likely to conform to odd surfaces, in this case the curved shoulder pad of a space marine. Stage 3: After soaking the decal in warm water, I like to brush it off the decal paper and onto the mini. I use a large fan brush as this lessons the worry of the decal folding over on its self as it comes off the paper. Get the decal in position and then gently soak up an excess water with the edge of a paper towel. If the decal shifts from where you want it at this point, just wet a paint brush and take it over the decal. Fresh water will float it up off the mini and you can reposition it. At this point you still may need some help to get the decal in the proper position. Two things that can help with this are softening and setting solutions. Softening solutions dissolve a bit of the decal film and allow it to further conform to difficult shapes. Setting solutions can also dissolve a bit of the film, but act more like glue. These solutions tend to smell like vinegar as well, so be prepared. Once the setting and softening solutions have dried you can usually stop. I however, tend to like to paint over any decals. 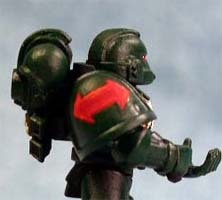 This allows you to shade or highlight the decal as necessary to make it fit in better with the rest of the miniature. It also allows you to correct any areas that may have silvered or that are shining from the solutions. The degree to which you paint over the decal is up to you. A 10/0, 15/0 or 20/0 brush is usually your best bet here, as you have less chance of killing the decals design this way.